The Rays have traded left-handed reliever Jonny Venters to the Braves in exchange for international bonus pool space, according to announcements from both teams. Mark Feinsand of MLB.com reports (on Twitter) that the Braves sent the minimum $250K to Tampa Bay in return for Venters. Venters’ remarkably implausible return to the Majors after three Tommy John surgeries and a five-year absence was already among the best storylines of the 2018 season, but the fact that he’s now been reunited with his the organization for which he made his MLB debut only adds to the feel-good nature of his comeback. The 33-year-old Venters broke into the Majors with Atlanta back in 2010 and immediately emerged as one of the better relievers in the National League, starring in a setup role for Craig Kimbrel from 2010-12 before going down with an elbow injury. Venters, incredibly, did not pitch in the Majors at all from 2013-17 before this season’s return as a member of the Rays. So far in 2018, Venters has appeared in 22 games for Tampa Bay and been utilized as a left-handed specialist, as evidenced by the fact that he’s totaled just 14 innings. He’s posted a 3.86 ERA and an 11-to-6 K/BB ratio in that time, though one of those free passes was intentional. Venters’ 2011 season featured a 72.5 percent ground-ball rate — the eighth-highest mark in MLB history — and he’s been in vintage form so far this year, inducing grounders at a 70 percent clip. Venters has faced 26 lefties on the season and held them to an awful .167/.231/.292 slash, while the 32 righties he’s seen have hit him at a .250/.344/.357 pace. Venters will give the Braves a fourth left-handed reliever, joining A.J. Minter, Sam Freeman and Jesse Biddle in the current relief corps for the time being. It’s not clear how the Braves will open a 25-man roster spot for Venters, though rookie Evan Phillips seems like a candidate to be optioned out. The Rays’ return is minimal, though some of the motivation behind the deal may simply have been to do right by the veteran Venters. They’ll boost their 2018-19 pool enough to be able to pad their offer to some of the remaining talent on the international market or to make another few lower-priced signings. For the Braves, their pool allocations aren’t as important as they are to other clubs, as Atlanta is barred from signing any individual player for more than $300K anyhow. The Rays are set to select the contract of left-handed reliever Jonny Venters from Triple-A Durham, reports Marc Topkin of the Tampa Bay Times (Twitter links). It’ll be the first appearance in the Majors for Venters since way back in 2012. The lefty was a star setup man for the Braves before injuries decimated a promising career. As Topkin notes, Venters has had three Tommy John surgeries in his career — two since his Braves days — as well as a “reattachment” procedure in 2016. Now 33 years of age, Venters burst onto the scene with the 2010 Braves, working to a combined 1.89 ERA with 9.9 K/9, 4.3 BB/9 and roughly 70 percent ground-ball rate in his first two big league seasons. Venters’ results took a step back in 2012, though he still turned in a strong 3.22 ERA with similar K/BB numbers and slightly diminished ground-ball tendencies in 58 2/3 innings before going down with injury. Venters didn’t pitch with any team’s minor league affiliate from 2013-15 and tossed just 27 2/3 innings in rehab stints over the past two seasons. He’s allowed a run on four hits and five walks with six strikeouts in 5 2/3 innings thus far in Triple-A Durham. Tampa Bay has an open spot on its 40-man roster, so no 40-man move will need to be made to accommodate Venters’ promotion. Righty Hunter Wood will be optioned to Triple-A to clear a spot on the 25-man roster, per Topkin. Venters will join Jose Alvardo and Ryan Yarbrough as left-handed options in manager Kevin Cash’s bullpen for the time being. The Orioles all but finalized their 25-man roster today, re-assigning left-handers Joely Rodriguez and Josh Edgin to Triple-A while sending Luis Sardinas, Alex Presley, and Cedric Mullins to minor league camp. (Jon Meoli of the Baltimore Sun was one of several reporters with the details.) While not officially announced, it seems as though Rule 5 draft pick Nestor Cortes Jr. has made the team based on these moves. Rodriguez’s minor league deal with the O’s contains an opt-out clause sometime this summer, MASNsports.com’s Roch Kubatko reports, and Rodriguez may have already attracted some attention after an impressive performance in camp. Rodriguez has an 0.87 ERA over 10 1/3 Spring Training innings, with just one walk against six strikeouts. It “seems likely” that veteran righty Blaine Boyer will make the Royals roster, MLB.com’s Jeffrey Flanagan tweets. Boyer signed a minor league deal with K.C. in February in the wake of a 2017 that saw him post a 4.35 ERA, 2.36 K/BB rate and 7.2 K/9 over 41 1/3 innings out of the Red Sox bullpen. In making the Royals’ Major League roster, Flanagan reports that Boyer will earn $1MM in salary, plus another $250K available in incentives. The Rays have informed southpaw Jonny Venters that he won’t make the team, Marc Topkin of the Tampa Bay Times reports (Twitter link). Venters has already said he’ll accept a Triple-A assignment and is likely to remain in the organization unless another team offers him a job in their big league bullpen. That scenario seems improbable, however, as Venters hasn’t pitched in the majors since 2012 due to three Tommy John surgeries, though he hasn’t yet given up his hopes for what would be an incredible comeback. Righty Jair Jurrjens has agreed to a minor-league pact with the Dodgers, Hudson Belinsky of Baseball America reports on Twitter and PG Sports first tweeted. The 31-year-old, who once seemed like a budding ace, last threw in the bigs in 2014 and did not pitch last year after a rough Triple-A stint the season prior. But Jurrjens reappeared in the World Baseball Classic, throwing 11 1/3 innings of 2.38 ERA ball for the Netherlands, and earned another shot at a comeback. Speaking of former Braves standouts, the Rays have brought back lefty Jonny Venters on a minors deal, Marc Topkin of the Tampa Bay Times reports on Twitter. The 32-year-old finally threw his first competitive pitches last year in the Tampa Bay organization, but again stalled out in his attempt to return from three Tommy John surgeries. The once-excellent southpaw hasn’t pitched in the majors since 2012. Veteran starter Bronson Arroyo made his second rehab start with the Nationals’ Gulf Coast League affiliate today, allowing no earned runs and two walks while striking out three over five innings. The 39-year-old is making his way back from partial rotator cuff tendon tears, and he still hopes to return to the big leagues in 2016, as MLB.com’s Bill Ladson tweets. It would be quite a comeback for the vet, who hasn’t appeared in the Majors since pitching 86 innings with the Diamondbacks in 2014. Here’s more from the East divisions. The Rays have announced that reliever Jonny Venters has a “left UCL injury,” and the injury is in fact a UCL tear, the Tampa Bay Times’ Marc Topkin writes (Twitter links). Venters briefly appeared in a rehab assignment in Class A+ this season. It’s been a brutal series of events for the lefty, who was attempting to come back after having Tommy John surgery for the third time. He is unsure whether to retire or continue to try to return to the Majors. Venters hasn’t appeared in the bigs since 2012, when he whiffed 69 batters in 58 2/3 innings for the Braves. Venters’ career stat line — 2.23 ERA, 10.1 K/9, 4.3 BB/9, and a ridiculous 68.4% ground-ball rate — is borderline dominant, but he can’t seem to make his way back to the mound. The Red Sox have moved hard-throwing righty Joe Kelly to the bullpen, Ryan Hannable of WEEI.com writes. “Power arm,” says manager John Farrell. “[T]his will be the first time that we’ve shifted him to that role here. This is for multiple reasons — for the time it would take to stretch him back out, potential of shorter stints, the stuff playing up, possibly more productive.” Kelly is currently returning from a groin injury and has not pitched since early June. He’s struggled badly in six big-league starts this season. Farrell believes Kelly can make it back to the bigs just after the All-Star break. As Hannable implies, Kelly’s move to the bullpen reinforces the likelihood that the Red Sox will look for starting pitching help later this month. Ubaldo Jimenez’s dreadful results with the Orioles this season (specifically over his past seven starts) may soon force the Orioles’ hand, writes MASNsports.com’s Roch Kubatko. Manager Buck Showalter declined to give an inkling of the team’s intentions with Jimenez, stating: “We have to look at other possibilities, but if we do something, he’s going to hear about it from us long before he reads about it.” As Kubatko points out, that type of sentiment from Showalter in the past has typically preceded a change, and the real question surrounding Jimenez is how drastic of a move the team will make. Eduardo A. Encina of the Baltimore Sun wrote last night that a release isn’t likely given the remaining money on Jimenez’s four-year deal, but Kubatko hears differently, writing that the O’s are willing to cut bait in spite of the financial considerations. Jimenez is owed about $7.89MM through the end of the season and is earning $13.5MM in 2017 as well. He has a 6.89 ERA through 62 2/3 innings this season and has seen his once blistering fastball dip to an average of just 89.8 mph. Former Braves setup ace Jonny Venters somewhat quietly returned to the mound after his third Tommy John surgery when he tossed a scoreless inning for the Rays’ Class-A Advanced affiliate earlier this month, as MLB.com’s Sam Blum writes. 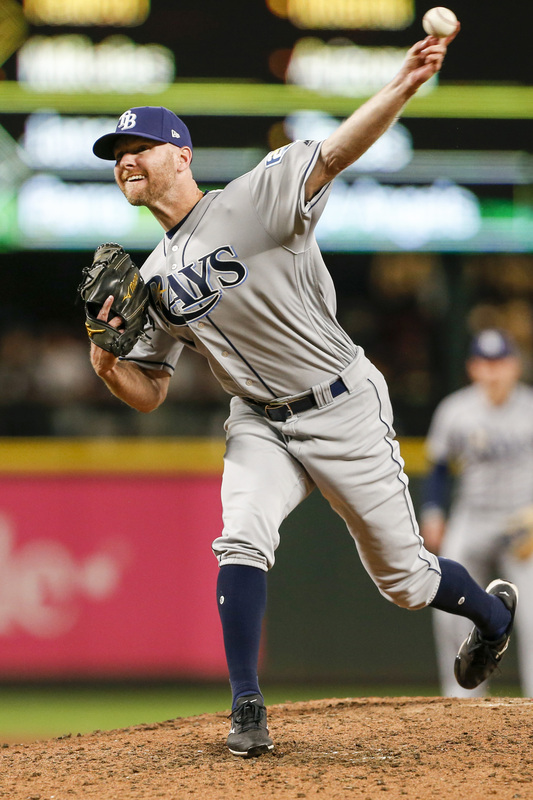 The Rays signed Venters to a two-year minor league contract last season, and the plan for him is to make about five appearances with Class-A Charlotte before being moved up to Triple-A Durham. If Venters, whose fastball touched 93 mph in his first appearance with the Stone Crabs, can show Major League caliber pitches and prove capable of throwing on back-to-back days, he could get a look with the big league club. Venters tells Blum that he doesn’t feel bad for himself whatsoever even after all of his arm woes, rather that he feels fortunate to have accomplished what he has in his career and to still have a chance. Blum also spoke to Venters’ former teammate Craig Kimbrel about the 31-year-old’s long journey back to the mound. “It shows a lot about who he is,” said Kimbrel. “He has some of the nastiest pitches, pure stuff in the game. … He’s giving everything he’s got. It’s special to be able to play this game, and he feels like he can still do it.” Venters, who has a career 2.23 ERA in 229 2/3 MLB innings, is looking to become the second pitcher to ever return from a third TJ operation, joining Jason Isringhausen. While Carlos Beltran is having a strong season and would love to remain with the Yankees beyond 2016, the team has yet to reach out to the free-agent-to-be about a new contract, reports Barry M. Bloom of MLB.com. Beltran has said he’d like to play for another two seasons beyond this one, Bloom adds. The 39-year-old slugger is hitting .277/.313/.554 with 16 homers on the season, placing him just three long balls shy of last season’s total of 19. As Bloom points out, Beltran’s excellent season is only further adding to a very legitimate Hall of Fame case; he ranks fourth among active players in WAR and reached a pair of notable milestones this season, belting his 400th homer and recording his 2500th hit (his 1500th RBI isn’t far off, either). Bloom spoke to both skippers who were present at Yankee Stadium this weekend — Joe Girardi and Brad Ausmus (a former teammate of Beltran) — and both said they think he’s already earned a spot in Cooperstown regardless of how the remainder of his career plays out. While the Red Sox are reportedly seeking both starters and relievers on the trade market, skipper John Farrell wouldn’t identify specific trade needs for his club when asked by WEEI.com’s Rob Bradford. Instead, Farrell chose to focus his comments on a need to get his team’s best players healthy. Farrell specifically mentioned Brock Holt, who has yet to pass IMPACT testing to clear him to return from the concussion he is currently battling. Farrell also took the opportunity to praise the replacement for Holt (and Blake Swihart), Chris Young, for his contributions in the clubhouse and on the diamond. Meanwhile, Evan Drellich of the Boston Herald tweeted yesterday that Farrell later added the hope for Holt is that he’ll be able to embark on a minor league rehab assignment this week.